A mass shooting at a Thousand Oaks, California, nightclub left 13 people dead, including a Ventura County sheriff's sergeant and the gunman, authorities said. THOUSAND OAKS, Calif. -- Using a smoke bomb and a handgun, a hooded Marine combat veteran dressed all in black opened fire during college night at a country music bar in Thousand Oaks, killing a sheriff's sergeant and 11 other people before apparently taking his own life, authorities said Thursday. Ventura County sheriff's Sgt. Eric Buschow, as well as Sheriff Geoff Dean, said they did not want to count the suspect among the 12 victims. One survivor was wounded by gunfire, and as many as 15 others suffered minor injuries from jumping out windows or diving under tables, authorities said. Names of the people who lost their lives in the shooting began trickling out Thursday afternoon. The death of Cody Coffman, 22, of Camarillo, was confirmed by his father. The other confirmed victims included Justin Meek, 23, a graduate of California Lutheran University; Sean Adler, 48; Blake Dingman, 21; Noel Sparks, 21; Daniel Manrique, 33; Jake Dunham, 21; Telemachus Orfanos, 27; and Kristina Morisette, age not yet released, who a close friend said worked as a cashier at the bar, and Mark Meza. "Sister Sister" actress Tamera Mowry-Housley and her husband released a statement confirming that their niece, Alaina Housley, was among those killed. Sgt. Ron Helus, 54, was killed responding to the shooting and trying to get patrons to safety. Chuck Goudie and the ABC7 I-Team have the latest information on Thousand Oaks shooting suspect Ian David Long. Authorities identified the suspected shooter as 28-year-old Ian David Long, a former machine gunner and decorated combat veteran of the United States Marine Corps, according to sheriff's officials. They added that they believe Long fatally shot himself after the massacre. He was found inside an office near the entrance of the venue. A motive for the shooting is still unknown. Long's gun, which appears to be a .45-caliber handgun, was purchased legally, according to ABC News. The Associated Press reports that he also deployed a smoke device. Long lived in the 800-block of Newbury Park with his mother, about 5 miles from the shooting scene. He appeared to have trouble adjusting to life after his deployment to Afghanistan. He was discharged honorably in 2013, and got divorced that same year. He was being treated for Post-Traumatic Stress Disorder. Deputies responded last April to the home over a call of a family disturbance. Mental health specialists talked to the suspect that day and cleared him, Dean said. Law enforcement officials are now at the Newbury Park home as part of the ongoing investigation. Perhaps because he was a military marksman, almost every person he shot was killed unlike most mass shootings, in which many are often injured by stray gunfire. Investigators said five unarmed off-duty police officers were inside the bar when gunfire erupted, and helped to usher patrons to safety. The shooting happened around 11:20 p.m. Wednesday at Borderline Bar & Grill at 99 Rolling Oaks Drive. Ventura County sheriff's officials said deputies initially responded to multiple reports of shots fired at the popular establishment. 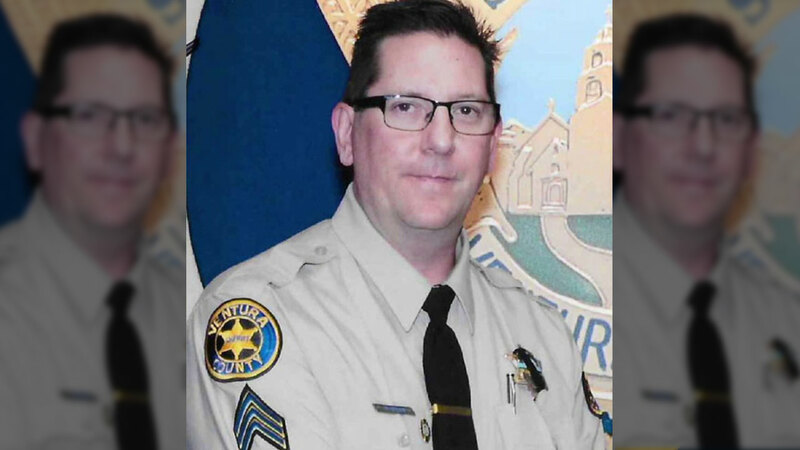 Sheriff Geoff Dean said the gunman immediately shot a security guard after entering the bar, turned to the right and shot several other security officials, employees and patrons. Two friends of the murdered security guard told ABC News he had survived the Las Vegas mass shooting. One of those friends was with him at the concert. They said they are heartbroken and completely crushed by this loss. Authorities said hundreds of people were inside the bar when the gunfire rang out. In an interview, Buschow came close to tears and said he knows the sergeant who died. "It's been a rough night for all of us," he said. Twelve people were killed when a gunman opened fire inside a nightclub in Thousand Oaks, California, near Los Angeles. During a 3 a.m. press briefing, Dean identified the sergeant as Ron Helus, a 29-year veteran of the department who considered retiring within the next year. At points he choked up, but said that Helus died a hero. Helus was the first officer inside the door, Dean said. By the time officers entered the bar again, the gunfire had stopped, according to the sheriff. Dean also said in his 41 years in law enforcement, he'd never experienced a mass shooting. He described the scene as "blood everywhere." He later revealed the massacre happened on his last day serving as sheriff. "I never thought I would see the things around the country that would happen, but I've learned it doesn't matter what community you're in, it doesn't matter how safe your community is, it can happen anywhere," he said. Helus was transported at 10 a.m. via motorcade from Los Robles Hospital to the Ventura County Medical Examiner's Office in the city of Ventura. Firefighters honored Helus with a giant U.S. flag raised by two ladder trucks over the route. People lined the streets as the hearse went by. President Donald Trump tweeted that he was "fully briefed on the terrible shooting." He praised law enforcement, saying "Great bravery shown by police" and said "God bless all of the victims and families of the victims." Witness John Hedge, of Moorpark, said he saw the suspect throwing smoke bombs into the front of the restaurant, located off Moorpark Road near the 101 Freeway. He also said he saw one security guard get shot. "I was at the front door and I was talking to my stepdad. I just started hearing these big pops. Pop, pop, pop. There was probably three or four, I hit the ground. I look up, the security guard is dead. Well, I don't want to say he was dead, but he was shot. Hedge added that there may have been about 12 shots by the time he got out of the door. He described the gunman as having a beard and wearing a hat, black jacket and possibly glasses. "I thought it was a joke when the shots started firing. I know people there. I hope everybody's O.K. I don't know how I didn't get shot," the man said. Tim, Hedge's stepfather, who was in tears, said he was next to the entrance about to leave after playing pool when smoke came into the room. Multiple law enforcement agencies, including Simi Valley and Oxnard police, arrived to help sheriff's deputies and SWAT officers. FBI agents also descended on the scene. FBI agents were also at the scene. The website for Borderline showed that Wednesday nights are College Country Nights that last from 9 p.m. until 2 a.m. Colleges near the club are California Lutheran University and California State University, Channel Islands, as well as Moorpark, Ventura and Oxnard College. Students from Pepperdine University in Malibu also often attend College Country Nights. The school later confirmed that at least 16 of its students were in the venue at the time of the incident. They said only one of those students was unaccounted for -- until it was learned victim Alaina Housley, who was a freshman at the campus, was killed. Aside from victim Justin Meek, it's unclear how many other students from California Lutheran University were at the bar during the shooting. The campus sent an alert to students that all classes are canceled for the day. A family unification center was set up at 1375 E. Janss Road, where several devastated families waited to hear news about their loved ones. An emergency hotline has been established at (805) 465-6650. Multiple blood drives are being held to help the victims of the shooting. To learn more on how to help those affected, click here. A woman originally from Bartlett describes escaping during the attack, and a student from Elmhurst decided at the last minute not to go to the bar last night. A Chicago-area native was inside the bar at the time of the shooting. Savannah Stafseth has a few cuts and bruises as she was trying to escape. She grew up here in the Chicago area. Her family lives in northwest suburban Bartlett. She called them to let them know she made it out alive. "A guy was able to throw me out the window," she said. "They had chairs and threw them out the window and they were able to take me and the girlfriend that I was with out the window and carried us right up here." One of her rescuers, Matt Wennerstrom, used a bar stool to break a window. He pulled Savannah and her friend out along with about 30 other people. Much of the crowd included college students from three nearby universities, including Pepperdine. Petey DiCianni, who is from west suburban Elmhurst, was supposed to be out with a group at the Borderline bar. But at the last minute he decided to stay home and do school work. "I immediately called one of my friends that was there," he said. "And she was in the hospital because she punched through a window to get out of the club." But one of his friends did not make it out alive. DiCianni was friends with Alaina Housley, who was killed. "Thank god he wasn't there," said his father Pete DiCianni, who spoke to ABC 7 Chicago at O'Hare airport. He was on his way to California to be there for his son, and brought along some homemade chocolate chip cookies. "I want to be out there for moral support," he said. "As a dad, if these were my friends I would be a basket case." Lawmakers said this tragedy may have been prevented in Illinois thanks to a new law on the books that mandate health care providers report patients receiving mental health treatment so they are unable to get a Firearms Owner Identification, or FOID, card. It's possible that the California shooter may not have been able to legally own a gun in Illinois. WLS-TV and the ABC 7 I-Team contributed to this report.